"We can find beautiful things, without consciousness. A fragrance that couldn’t exist in a bottle that shouldn’t exist but what qualifies anything for the right to exist? Who has the right to decide what should be rejected?" "A rejected bottle survives to hold an imaginary flower constructed linearly, the fragrance opens with manmade organic composites of aldehydes and safraleine, opening up slowly to hawthorns and derivations of lilac, before exploding in a riot of flower oxides, then finally succumbing to notes of industrial glue and brown scotch tape with hints of musk and Styrax". "Purposely taking a bottle that has been disqualified from existence and purposefully giving it its right to exist". So, where to start? Here: Comme Des Garcons at its finest! If you've been compelled by the most avant-garde deliveries from this house such as Odeur 71, Odeur 53, CDG for Stephen Jones, Guerrilla 1 or their Synthetic Series, you're in the right place as "Eau De Parfum (2011)" moves in the same direction of their most abstract/industrial/conceptual/ pushed-to-the limit type of stuff. All the CDG's hallmarks are here including the bottle that doesn't stand up on its own, but what it smells like? A floral leather! Well...sort of. If this definition brings to mind of Chanel Cuir De Russie, Jolie Madame, Tabac Blond, Cuir De Lancome or Knize Ten be aware that this is nowhere similar to any of them. The rendition of the floral leather represented in "Eau De Parfum (2011)" is similar to what Kazimir Malevich achived with Suprematism in the meaning that a Suprematist is associated with a series of aerial views rendering the familiar landscape into an abstraction... In this context Eau De Parfum represents both the florals and the leather in a sort of familiar yet completely "new" way. Flowers are mechanical, industrialized, alien, stylized yet clearly flowery. The leather (achived with a considerable dose of safralaine) smells aseptic, brand new and treated but at the same time provides a remarkable warmness and a touch of humanity to this robotic monster. Eau De Parfum (2011) is surely an android but with a big red and pulsating heart and a tad of sweetness. To all of the above you have to add something even more chemical that is what they call "Industrial Glue" and "Brown Sticky Tape". In this phase Eau De Parfums delivers exactly what he promised: the most true to life rendition of Brown Packing Tape and Bostitch Glue. Two of those type of smells that usually don't belong to body fragrances but we all still love (same as for gasoline, kerosene, steam iron, wet soil, brand new cars, tar and the likes). In this context the mastery of the perfumeur was to blend all of the above elements into a fragrance that results very wearable, comfortable and naturally plausible. Far form the typical approach we're used in traditional perfumery but nonetheless fascinating. Wondering if this is more a smell than a proper fragrance? NOT AT ALL. 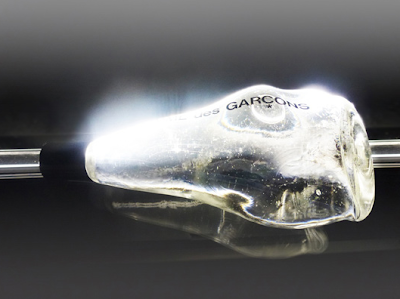 The new Comme Des Garcons is a terrific perfume, modern yet extremely solid, very distinctive, versatile and easy to wear but it's surely not for everybody. Personally I've never smelled something like it. Lasting power is very good as well as projection. Since 1994 Comme Des Garcons is confirmed to be the reference house for avant-gard, innovative and futuristic compositions (not to talk about their fashion collections) and after almost two decades we're so glad to discover that they still have a lot to add on the table. Kudos! One of the most common concerns when Comme Des Garcons announced the launch of this fragrance was the presence of safralaine (an aromachemical that smells somewhere between saffron and leather) that was previously included in their 8.88 with a disastrous result. Let me reassure everybody saying that the new Eau De Parfum shares absolutely no similarities with 8.88. The safralaine here is very well blended, never overdone or too prominent and mainly used to provide a leathery feel. Thanks for the great review. Im now very intrigued by this. I'm very curious about your take on this, report back as soon as you've tried it.